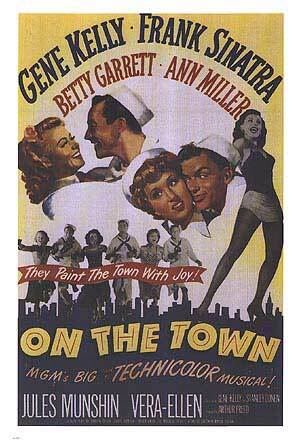 But that's exactly what On The Town does, a film adapted from the musical of the same name. The plot is admittedly a bit silly - three sailors arrive in New York with one day to experience as much of the city (and the women) as possible. The trouble is that the film only vaguely follows the narrative and script of the original musical and for the most part lacks any form of darkness or danger. This is fluffy, camp Hollywood through and through. More unforgivably, much of Bernstein's music is substitued for cheesy, romantic schmoltz by Roger Edens. In fact, despite this being a musical, the music and nasal, flat singing are the worst parts of the film. Unsurprisingly, those sections that utilise Bernstein's score are the standout moments - from the opening 'New York, New York', to the fantastic Miss Turnstiles dance routine and the dream ballet which serves as Gene Kelly's moment in the spotlight (literally). The emphasis on tap dance is a welcome one - Anne Miller in particular has a spectacular routine. Despite its obvious flaws, you can't help but be swept along by its charm. In the words of Hildy, the film is "so-so...so, so charming".